Ozone (O3) therapy is considered alternative medicine and is supposed to increase oxygen in the body in hopes of healing the body. Though O3 often comes with a negative connotation, but some studies are starting to show benefits with healing. The question is, why don’t more doctors recommend it or use it more often? Some believe that it can be healing to the body and can apply therapeutic effects as well, while others say it doesn’t actually do anything and the effects contradict one and other. It can be hard to decipher if pure ozone can be healing, or if pollutants in the ozone can be damaging. But what is the truth, is it safe and beneficial or is it harmful and damaging to your body? We wanted to share both sides of the ozone therapy beliefs and let you and your doctor make your own decisions. 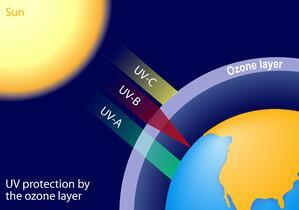 Ozone is a colorless gas with a slight smell and is composed of 3 atoms of oxygen (hence O3). Ozone is the main component of smog and is also created from car emissions and factories that burn fossil fuels. This human production of additional ozone found in smog can cause respiratory illnesses in people and animals. It is also beneficial and is one of the outer layers in the atmosphere protecting us from cancerous UV rays. Natural levels of ozone (what is found naturally on the earth without any human production) isn’t damaging to humans, as it doesn’t contain many pollutants or high levels like smog. The levels of ozone occur naturally when it interacts with soil and plants, this occurs in the lowest level of the atmosphere (troposphere). Ozone therapy is introduced to the location of the body that is damaged (such as an infected knee). The therapy is then introduced to the area and can stop the growth of bacteria that is damaging the body. Infections from bacteria, viruses, fungi, yeast or protozoa can all be stopped if introduced to ozone therapy. Gaseous forms of medications are very uncommon, as it can be very dangerous if not administered properly. Diseases treated with O3 include infected wounds, circulatory disorders, geriatric conditions, macular degeneration, viral diseases, rheumatism/arthritis, cancers, severe acute respiratory syndrome (SARS), human immunodeficiency virus (HIV), and acquired immunodeficiency syndrome (AIDS). Breathing disorders can also be benefited by ozone therapy, in current studies for those with asthma and COPD, it has been shown to help provide oxygen to the blood, leaving less strain on the lungs. Those with diabetes may also show benefit from ozone therapy as studies are showing that it can help supply oxygen to the blood and tissue to those people. Ozone therapy has been shown to help those with an immune disorder, helping to stimulate the immune system. In the age of alternatives, alternative medicine is no different, as no one wants to take conventional medicine that can have severe and damaging side effects. More than ever ozone therapy is being studied in order to determine the effectiveness and side effects it may have. In other countries (Germany, Russia) ozone therapy is more widely used, but currently is not often used in the U.S. Many clinical trials are being done in hopes of shedding more light on ozone therapy and the benefits or issues it may bring. Arthritis in the knee and other inflammatory diseases are being studied by their reaction to ozone therapy. The American Cancer Society urges cancer patients to avoid looking into oxygen treatments as there is not enough information about them and they can actually cause more harm than good. The FDA found no medical benefit to ozone therapy at this time. As each form of ozone therapy may be more personalized based on the individual, speak with your doctor about what to prepare for during your therapy. A common form of ozone therapy is to draw some of your blood, mix it with ozone gas and re-administering it back into the body. If you are to get your blood drawn, make sure you follow all doctors’ orders and stay hydrated if you are not told to fast. If you are getting ozone therapy to the tissue: It is most likely due to a extremity issue or infected wound and will be administered to the area of issue. If you are getting ozone therapy intravenously (in the veins): It is a treatment for internal disorders, such as HIV and is often mixed with blood drawn. If you are getting ozone therapy intramuscularly (in the muscles): This can be for many reasons, but in addition to the ozone, sterile water is also added to the mixture. 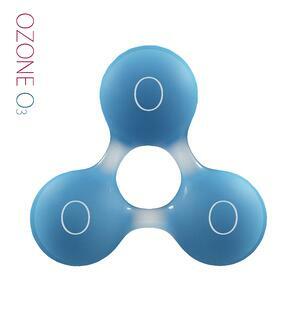 Side effects can occur with ozone therapy, which is why it is not often prescribed in the U.S. Some side effects of ozone therapy can be very dangerous, such as ozone (O3) has 3 atoms, and an odd number can be very unstable and unpredictable, and too much oxygen can be damaging to red blood cells. The cost can vary about the treatment plan you may look into, but many insurances do not cover ozone therapy as there is not enough research available and Medicaid also does not cover it. There are many new studies being done about ozone therapy to deem if it is safe and beneficial, or too dangerous to prescribe. It is something that can go very well and show results, or it can lead to no results or negative results. 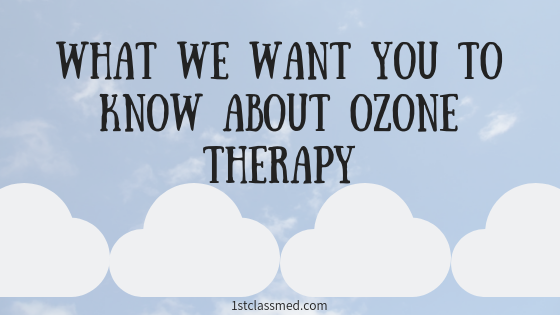 Overall it can be a discussion between you and your doctor if you have interest in trying ozone therapy, but be warned that it is still being heavily studied. It is important to understand what ozone therapy is before you choose to participate in a trial or if you decide it is not for you. There are hopes that ozone therapy can be beneficial and help those in pain, but there is also a possibility that it can do more harm than good.